Germany has begun the deployment of tanks to Lithuania as part of the NATO mission to bolster confidence in Eastern European allies. It comes as US and Polish soldiers conducted joint drills to deter “unlikely” potential aggression from Russia. 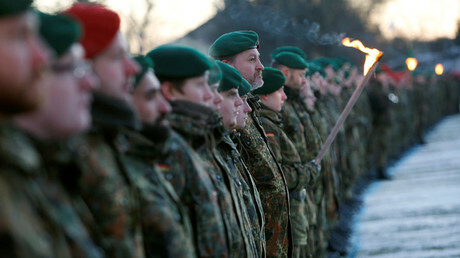 Germany is one of the countries that agreed to provide troops and weapons for the NATO mission, which involves deploying four battalions in Poland and the three Baltic states. The German command said it was sending about 200 military vehicles, including 30 tanks along with 450 troops. The movement of forces, which started on Tuesday, will continue until late February, it said. The German troops in Lithuania may soon be joined by soldiers from Belgium, the Netherlands and Norway, boosting the strength of the battalion to some 600 troops. 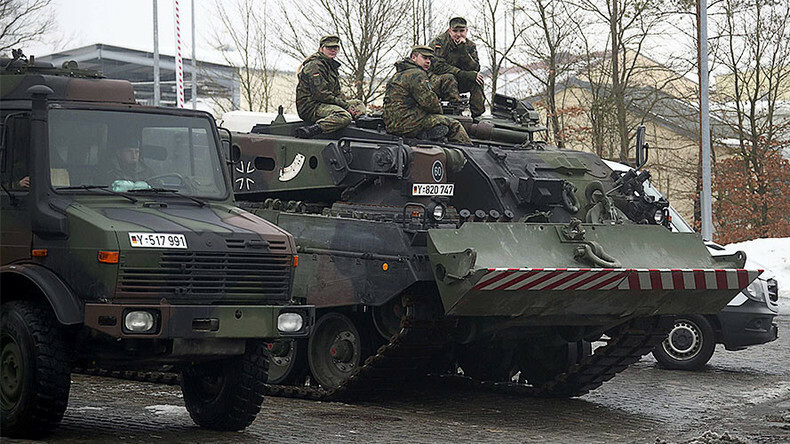 The Germans are bringing Marder armored vehicles and Leopard 2 tanks as part of the deployment. In early January, US heavy weapons and troops started arriving in Poland via Germany as part of the same mission, dubbed ‘Operation Atlantic Resolve’. Eighty-seven US battle tanks, 144 Bradley fighting vehicles, and 3,500 soldiers arrived in Europe earlier this month as part of NATO’s buildup near Russia’s borders, agreed at the NATO summit in Warsaw in July. The current conservative government in Poland is spending hundreds of millions of dollars on buying advanced NATO-compatible weapons like JASSM-ER cruise missiles from the US and other allies. In addition to inspiring confidence in European allies, the operation is testing NATO’s readiness to transport large amounts of military hardware across the continent, a task that has reportedly faced several glitches such as convoys failing to pass under bridges that turned out to be lower than expected. The military buildup in Eastern Europe is the largest since the Cold War and could put into question the NATO-Russia agreement which bans permanent deployment of significant forces by the alliance in Eastern Europe. NATO deflects such notions, saying the agreement did not specify how big a force should be for it to be considered “significant,” and insists that the deployment is rotational rather than permanent. NATO decided to boost its military presence at the Russian border in the wake of the political crisis in Ukraine, in which an armed coup in Kiev brought an anti-Russian government into power. The peninsular region of Crimea and two eastern regions of Donetsk and Lugansk refused to accept the coup-installed Ukrainian authorities. Crimea subsequently voted in a referendum to rejoin Russia, a move that Kiev and its foreign sponsors consider an illegal annexation rather than an exercise in the right to self-determination. Among the most vocal members of NATO, Poland and the Baltic states claimed that Russia could attack them after the events in Ukraine, prompting leading members of the alliance to agree on troop deployments. Moscow denies any aggressive intentions against NATO members and says the alliance is using a pretext to compromise Russia’s national security. The Russian armed forces have boosted their strength near the western border in response to the buildup.